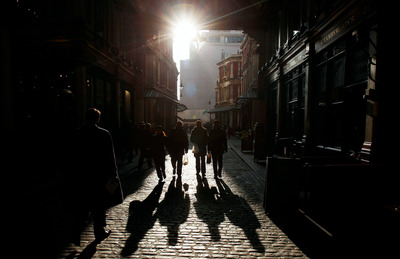 Retuers/ Luke MacGregorGoldman Sachs bankers walking down a London street. Rollins claimed he was unfairly terminated over his role in a series of transactions involving an unnamed financier who had legal issues in the past. He’s seeking $US50 million in damages. The lawsuit set tongues wagging on Wall Street and in the City of London, given that it names several of Goldman Sachs’ most senior staff members in London. A lawsuit Thursday sent Wall Street and the City of London buzzing, given that it mentions a “whistleblower,” an unnamed “notorious European businessman,” and a handful of Goldman Sachs bankers, one of whom is a member of the incoming CEO’s inner circle and others nicknamed by some at the firm as the Aussie mafia. Christopher Rollins, a managing director and 16-year veteran of the bank, sued the firm over what he alleges was an unfair termination over his role in a series of transactions involving a financier that he didn’t name, according to the suit, which seeks $US50 million in damages. The complaint names Jim Esposito – promoted this week to cohead of Goldman’s securities division– as a defendant and details involvement of the Goldman bankers Michael Daffey and John Storey, among other leaders. The suit talks about several transactions Goldman conducted on behalf of the financier, who had legal issues in the past, the complaint says. The complaint says the entire affair started when Daffey and Storey met with the financier in 2015 to explore ways the firm could bring him on as a client. The two are among the most senior members of Goldman’s equities business. The Financial Times reported that Storey earlier this year attended the infamous President’s Club dinner in London, where, the newspaper has reported, women servers were groped and propositioned. Daffey was also on the President’s Club invite list, though the firm has said he didn’t attend. Hailing from Australia, the two are known by some internally as the Aussie mafia, according to some people who know them. Michael DuVally, a Goldman spokesman, declined to comment on the characterization, and neither exec returned phone calls seeking comment. The complaint alleges the financier told the bankers that he had $US1 billion to invest. Rollins claims that while he had met the financier socially, he never sought to do business with him. August 2015: Daffey and Storey travel to Windhorst’s 200-foot yacht in the Mediterranean to pitch for his business. Part of the deal would be working with what the complaint called an “obscure” brokerage with ties to the financier. September 2015 to August 2016: Daffey, Storey, and former Vice Chairman Michael Sherwood “used their influence within the firm” to steer a series of transactions around the firm’s compliance controls, it says. Issued $US1.2 billion in bonds – $US700 million in September 2015, then $US500 million in June 2016 – structured by an unnamed broker affiliated with the financier. The Financial Times has previously reported on transactions involving the sale of two bond issues totaling $US1.2 billion on behalf of several special-purpose vehicles. The funds went to loans to airlines around the world, including Etihad, Air Berlin, and Alitalia, it said. Anoa Capital, a broker in which Sapinda Group had purchased a stake in 2013, helped arrange those deals, according to the September article. Opened a second account, in London, to execute a single trade worth more than $US400 million in July 2016, earning $US7 million in fees. While an internal committee initially rejected the trade, it was approved after Daffey appealed to Richard Gnodde, a Goldman vice chairman. Reuters reported in July 2016 that Sapinda Group used Goldman Sachs to help it sell a 19% stake in an Austrian real-estate firm, Buwog, for about $US400 million. Exhibit 1 of the complaint mentions a Buwog transaction. Goldman also executed a series of trades for securities in a second European company that were sold to some of the bank’s other clients. August 2016: One of the Goldman clients who agreed to buy a stake in the second European company couldn’t come up with the money, leaving the bank on the hook for $US85 million. September 2016: Goldman compliance execs interviewed Rollins and told him he should not have had any contact with the financier. Rollins claims that Daffey, the co-chief operating officer for the equities unit, and Storey, a cohead of equity sales for the region, told him they had “arranged” for Esposito to be the decision-maker and that he would be a “friendly arbitrator,” the complaint says. Rollins alleges that Daffey told him that if he “didn’t fight the charges, and was ‘contrite,’ he’d receive no more than a slap on the wrist.” Rollins claims in the complaint that he didn’t do anything wrong.